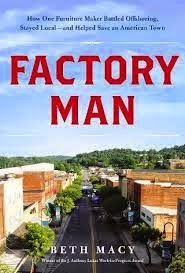 Factory Man by Beth Macy is an interesting book about offshoring, rural America and where income equality comes from. The book tells the story of John Bassett III and his Vaughn-Bassett Furniture Company that employs more than 700 people in the South and manufactures entirely in America. While the book provides a largely positive view of both the man and company, which has a section about Macy's book on it's website, it's definitely not a puff piece, but rather an account of a family, company, industry and the costs of globalization on U.S. manufacturing and the works who used to do it. The book was an excellent one and further information on it can be found in a New York Times review by Mimi Swartz and Businessweek Q&A with Macy.